How Can You Know That God Loves You? Let me know what you think if you view or download the video! If you want to know more about becoming a Christian or being a Christian, make a comment and we will get in touch with you! God Loves You 07 - How can you know God loves you? Today we have Jessie and Evie! Be amazed! See and hear how they tell you that God loves you! A good reminder for the Christian and a beckoning call for those yet to be a Christian! God loves you. Let me say that again. 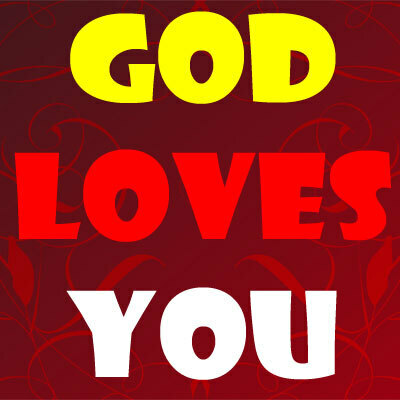 God loves you. Isn’t that amazing? God loves you. It doesn’t matter what you have done, what you haven’t done – God loves you. God loves you irrespective of your gender, your sexuality, your marital status or none, your age, your culture, your background, who ever you are, what ever you have done. It remains a fact. God loves you. He is beckoning you to love Him in return. He wants you to be in relationship with Him. Nothing you can do will make Him love you more than He already does. Perhaps the most famous sentence in the whole world is this: “For God so loved the world, that He gave is one and only Son, so that who ever believed in Him would have everlasting life.” John 3:16. You can choose to have that life right now and accept God’s love for you. God won’t force you to love Him in return, because if He forced you, that wouldn’t be love. God’s love is compelling but it is not coercion. Once you accept His love and enter into a loving relationship with Him, be prepared to be transformed into a much better person. I look back over the 33 years since I started my relationship with Him, and I am so glad I am transformed from that time and that in the future I will be transformed even more. I can’t promise in what areas He will want to transform you, but He is reliable and will help you. He will come and live inside you. God loves you. I can’t promise their won’t be hard times for you, but God will be with you through what ever it is you go through – each second of each minute of each hour of each day. God is seeking you out to return His love. Will you not do that now before it is too late?